Gosaikunda is one of the most famous religious places of pilgrimage in Nepal, situates in Langtang Himal range. A lake called Gosainkunda itself is situated here at 4380 meters. There are some other popular Goasikund lakes near are Nagkunda, Suryakunda, Saraswatikunda and Bhairabkunda. The route to Gosainkunda passes through varied landscapes ranging from evergreen forest to sub alpine grasslands where cascading waterfalls and beautiful mountains make an addition to its beauty. It is surrounded by high mountains on the north and the south the lake of majestic and picturesque. It is one of the most exhilarating journeys available through the Himalaya. Day 02: Kathmandu – Sight seeing Tour. Day 03: Kathmandu – Lukla by flight and trekking to Phakding, overnight in Teahouse. Transfers airport – Hotel – Airport. Transportation by car for sight seeing in Kathmandu valley. Transportation by bus Kathmandu - Dhunche / Sundarijal - Kathmandu. 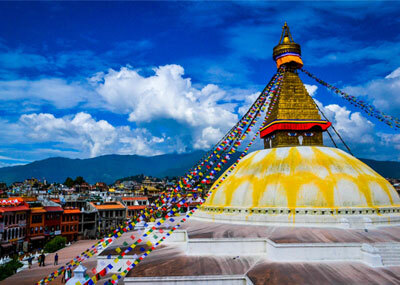 Guide for sight seeing Kathmandu. Accommodation in Standard Hotel on B. B. plan in Kathmandu. Accommodation in teahouse in trekking. Porter/s (1 porter for 2 trekkers/approx. 10 - 12 kgs per trekker). Equipments: down jacket, down sleeping bags. Trekking permits (TIMS & National Park Entry Permit).